UDF president and 2014 presidential hopeful Honorable Atupele Muluzi will launch a “Jubilee Movement” on 15 May 2013 in Blantyre. 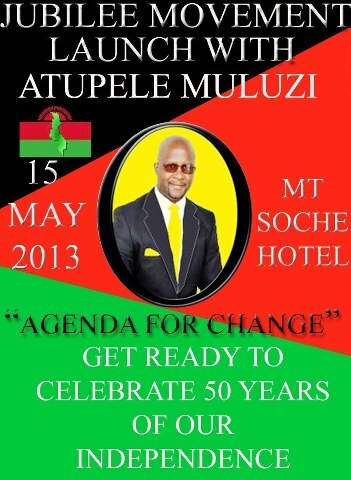 Opposition UDF president and 2014 presidential candidate Atupele Muluzi will launch a ‘Jubilee Movement’ next Wednesday May 15 in Blantyre to champion transformational change as Malawi turns 50 years next years. UDF president and 2014 presidential hopeful Honorable Atupele Muluzi will launch a “Jubilee Movement” on 15 May 2013 in Blantyre. This is one way of championing the transformational political change as Malawi turns 50 years of its independence next years from Britain. The event will be launched at Mount Soche in Blantyre.